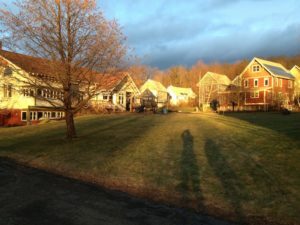 Our Board member, Lisa Thomas, had the great opportunity to attend the Northeast Co-Housing Summit last month in Amherst, MA where she attended workshops about designing and running an intentional housing community. She also met with others living in existing co-housing communities or getting ready to launch their own. 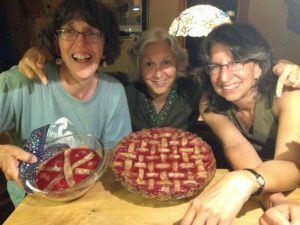 The highlight of her experience was visiting Pioneer Valley Co-Housing, a community that started 25 years ago with a focus on social connections and shared experiences. This multi-generational community of 32 families living on a six acre footprint includes a Common House, described as the “Living room of the community,” clustered homes, pedestrian walking paths, community gardens and outdoor recreational spaces. Each resident contributes to the well being of the community by volunteering 6-8 hours a month to organize activities, maintain the community, cook occasional shared meals, or other activities designed to bolster a sense of community support and connection. The community encourages “random connection by design” with a carefully designed footprint that includes, public, semi-private and private spaces for all residents. Every neighbor knows everyone in the community, children play freely outdoors and often visit frequently between the houses, and members support each other through personal challenges, as well as celebrating small successes and major milestones. The community is so popular, they have a long waiting list of families who want to move there and have opened up associate memberships for others to participate in community life while waiting. Residents own their own homes, but pay monthly fees similar to a Homeowners Association for maintenance and upkeep of the community. After experiencing a weekend at Pioneer Valley and seeing how well this concept works, Lisa may well be the first to make a down payment on a home in Hope Family Village!